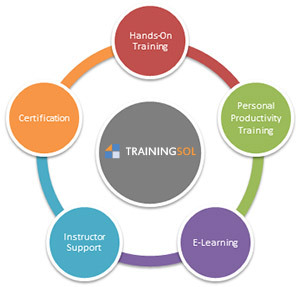 TrainingSol specializes in instructor-led and e-learning training to the employees of non-profit organizations, commercial enterprises and government agencies. We offer open enrollment classes that are available to any student, and private, custom classes where clients can modify our course outlines to fit specific needs and add real work examples to the course content. Our instructors are professionals in their fields. They don't just teach this stuff; they use it every day! You can be sure to get real-world experience and relevant exercises during training. We also offer some of the best e-learning modules available anywhere. Improve your IT skills with self-paced, interactive, and engaging online training. Login from our state-of-the-art training center or from the comfort of your living room. Browse our catalog an register now!